In Italy, Art Deco was influenced by local artistic and ideological trends that resulted in a distinctive national graphic style. This is sometimes called Futurism graphics, from the name of a movement which defended an aesthetic based in the break with tradition and the emulation of speed. Although Futurism in its purest, rather anarchic form, declined in the 1920s, its influence is noticeable in many later posters and labels that strive to give a sense of change and the transient. This was done, either by the use of symbols of speed like cars and planes, by the airbrushing of colors into white, or else by the use of a number of discordant, often hand-drawn and irregular, typefaces. Such graphics were not universally acclaimed and many clients ordering hotel labels, posters or prospects must have squarely specified that they wanted their commissions designed in the 'old style'. Richter, for instance, very rarely issued labels in the deco graphic style. The Genovese printer Barabino & Graeve (later renamed "Saiga"), on the other side, used Futurism Deco graphics to great effect. One of its best artists was Filippo Romoli. Romoli was born in 1901 in Savona. In 1919 he moved to Genoa with his family and eventually found work as draugthsman with a local manufacturer of electrical machinery, while doing artistic work as a freelancer. 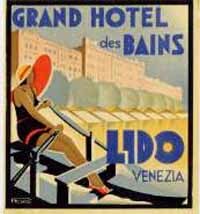 In 1926 he started doing publicity graphics for Barabino & Graeve. He designed many posters, folders and other similar paper graphics. 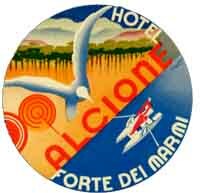 He also did a number of hotel labels, in the Deco style, which he fortunately signed. After the war he diversified into other fields of artistic creativity, working almost until his death in 1969, but is best remembered for his Deco posters of the late 1920s and 1930s. Although Romoli was an efficient designer and left some remarkable hotel labels (three of his best: Hotel des Bains, Corno d'Oro Hotel, and Hotel Alcione are included in this page) he was not influential in the same sense as Richter's artists were. Actually he does not show a coherent, distinctive style as can be asserted through the many different designs in this page several of which are only identified as his by the signature "F. Romoli". Also he did not fall on an aesthetic desert-like environment to which he might become a bearer of color and style as, in a manner, Mario Borgoni once had been. Romoli was a good artist but only one of a large pleiad of gifted designers that were the source of the great Italian graphics of the 1920s and 30s.